warning Hi, we've moved to USCANNENBERGMEDIA.COM. Visit us there! The bell rings as you push through the doors to the café. Behind the counter is a quiet woman of color. She’s timid and the tapping of her fingers reveals her nerves. “What would you like to order?” the barista said. The Downtown Women’s Center is a non-profit organization that helps tackle homelessness on Skid Row in Los Angeles. The organization works to train, empower and encourage homeless women through work opportunities in their retail store and café, “Made by DWC”. Tomorrow night they are hosting their annual holiday shopping party. Siaz said the barista behind the counter was once homeless. She is training under Saiz now. DWC has a 12-week program for the women, called “Set to Work” that helps prepare them for their next job opportunity, said Siaz. During the day, the women are placed under the supervision of DWC employees who will guide their time at work. Siaz has said that some women are housed while in the program. Siaz knew the mission of the organization and enjoys working for DWC because the organization believes homelessness is not inevitable. But when Siaz witnessed the process of rehabilitation through a trainee, her passion grew stronger for the organization. The Los Angeles Area Chamber of Commerce said Skid Row is comprised of roughly 50 city blocks of the greater downtown area, generally east of the Downtown Historic Core and the high-rise district of Bunker Hill. Los Angeles city and county are working to expand homeless outreach teams on Skid Row. Officials say their goal is to cut the area’s homeless population by 25 percent this year, according to LA Times reporter Gale Holland. “City Councilman Jose Huizar filed a motion asking that $200,000 of his discretionary funds go to hiring a logistical manager to set up four six-person teams of mental health, medical and substance abuse professionals operating in the streets five days a week,” Holland said. A recent report by the Downtown Women’s Action Coalition said there are various factors that cause women’s homeless in the United States including domestic violence, lack of affordable housing, job loss and unemployment, substance and drug abuse, mental illness and physical disability. 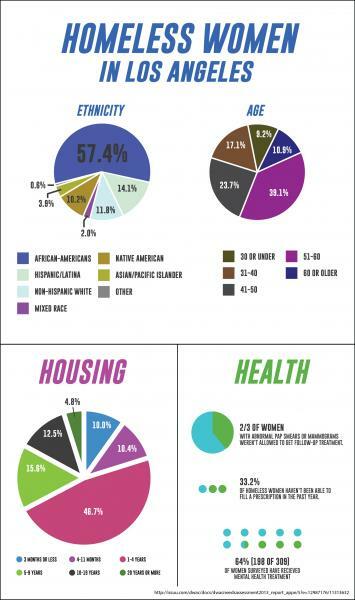 After surveying nine sites throughout Skid Row a total of 324 surveys show the top three resources that women need most to improve the downtown community are housing, healthcare and employment or training opportunities. The lack of affordable or low-income housing was the largest variable in keeping women homeless – 73 percent of respondents listed housing as the most essential resource. MADE by DWC helps address the employment and training gap for homeless women. Not only do they work in the café or retail store, but they also work to create hand made jewelry and crafts that are sold in both the café and retail stores. The handmade items will be sold at the event on Dec. 3 to kick off the holiday season and spread awareness about the organization. All of profits from the event will benefit women overcoming homelessness in Skid Row. Reach Contributor Joy Hahn here. Watch USC Annenberg Media's live State of the Union recap and analysis here. © 2008-2010 USC Annenberg. All rights reserved.